Why didn't St. Louis and St. Louis County meet their 10-year goal to end chronic homelessness? 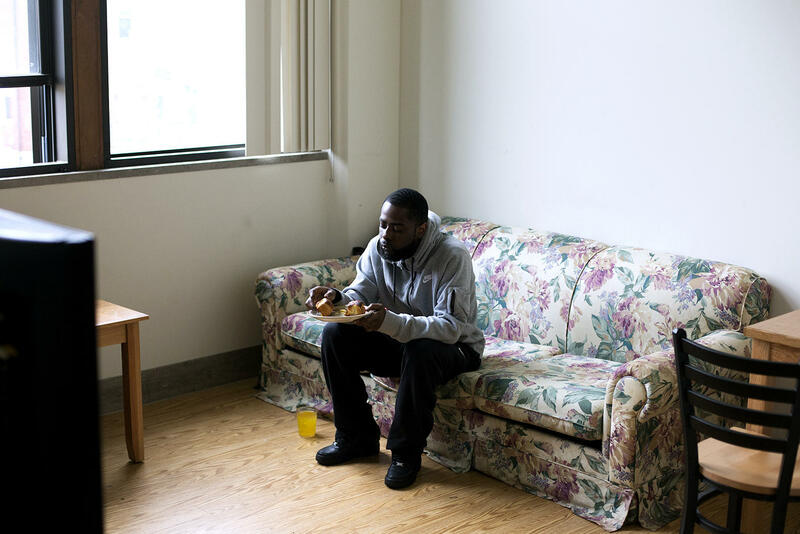 Quinton Reed eats a home cooked lunch and watches TV at his Garfield Commons Apartment. Reed was diagnosed with schizophrenia after years of struggling with homelessness. Quinton Reed is one of the lucky ones. After struggling with homelessness for four years, he was diagnosed with a mental illness and set up with treatment and a one-bedroom apartment in south St. Louis. “I used to couldn’t watch TV or see my daughter or see my family or just relax. I was just out all day carrying big bags, going from shelter to shelter and sleeping outside,” said Reed, showing off the couch in his living room where he goes to relax and get away from the world. Sometimes Reed chose to sleep on the streets because being in shelters surrounded by people exacerbated his mental illness. St. Louis Public Radio's Camille Phillips asked government officials and nonprofits that serve the homeless why they didn't meet their ten year goal to end chronic homelessness in St. Louis City and County. "My anxiety be real bad, I hear voices. I have suicidal thoughts. That's why I like to be to myself. I don't like to be around people because when I be around people that's when my voices they start getting out of control and bothering me," Reed said. Quinton Reed poses for a portrait at his Garfield Commons apartment. Since he landed the apartment last year, he's been able to receive visits from his daughter. Now he can shut his bedroom door and listen to R&B whenever he wants to calm all the loud voices. Reed’s apartment is one of almost 500 new permanent units added to the city’s homeless housing roster since 2005 as part of a joint St. Louis-St. Louis County 10 year plan to end chronic homelessness. St. Louis County added just over 200 in that time span. The beds are reserved for the chronically homeless: people who have a disability and have been homeless for at least a year, or have had multiple bouts of homelessness in the past few years. But despite a decade spent beefing up permanent housing, the number of chronically homeless people living on the streets or in temporary shelters in St. Louis and St. Louis County was roughly the same in 2015 as it was in 2005. “The fact is, if we didn’t have all this housing we’d have a lot more people on the street. In other words our numbers probably would have went up,” said St. Louis Mayor Francis Slay. Slay pointed to the recession and the 2012 closure of the Metropolitan Psychiatric Center as key reasons the city only saw an 18 percent reduction in its chronic homeless population. That’s according to a federally mandated headcount conducted on a single night each year in January. Asked about homeless people from the county going to the city for help, St. Louis County Executive Steve Stenger said the county is meeting the needs of its homeless. Stenger didn’t become county executive until the last year of the plan. He questions whether the previous administration ever took steps to implement it. St. Louis County said it started following the Housing First model of serving the homeless in the past year. That’s the model recommended by the U.S. Department of Housing and Urban Development, and the model social service agencies that adopted the 10-year plan say they follow. 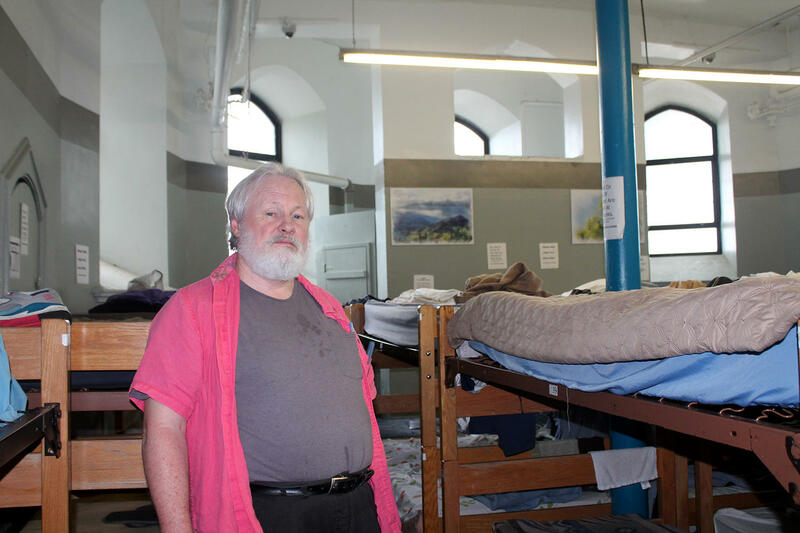 Tom Burnham stands among the bunk beds in the basement of St. Peter and Paul Catholic Church in the Soulard neighborhood, where Peter and Paul Community Services operates an emergency shelter for men. “There were some flaws in the plan as we understood it in 2005,” said Tom Burnham of Peter and Paul’s Community Services, one of the nonprofit agencies that helped craft the 10-year plan. Peter and Paul, St. Patrick Center, Places for People and the Salvation Army also adopted the plan as part of the city or county’s network of homeless service providers. Burnham served as shelter manager for Peter and Paul for decades. He thinks the plan called for too many apartment complexes set aside for the chronically homeless like Peter and Paul’s Garfield Commons, where Quinton Reed lives. Burnham said it took Peter and Paul five years to find a location for Garfield Commons that had the support of the neighborhood. He believes the best way to end homelessness is to build up the region’s affordable housing stock. “We need to allow it first of all, and we need to incentivize private developers. And I know they’re there. If they could make a reasonable profit they’ll do it,” Burnham said. Burnham’s stance is similar to the explanation provided by the executive director of Places for People, Joseph Yancey. 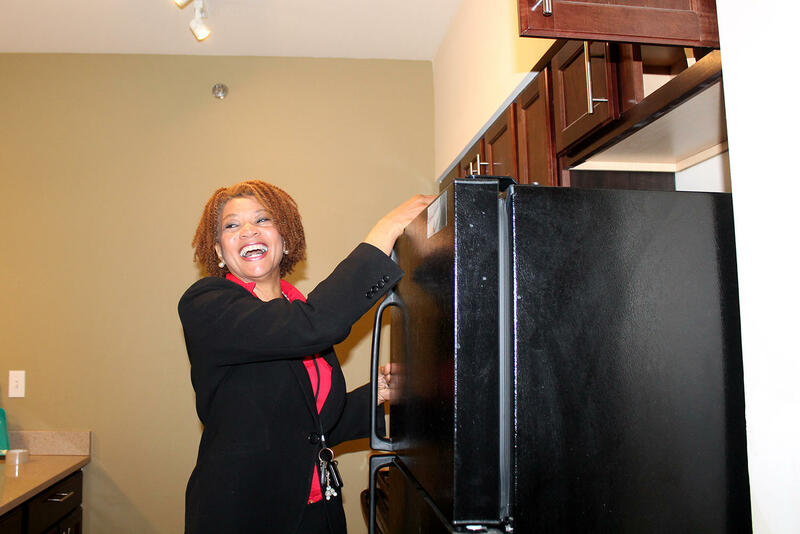 Kimberly Beck closes a cabinet door in the kitchen of an apartment undergoing renovation at Salvation Army's Veterans Residence in midtown St. Louis. The Salvation Army’s Kimberly Beck was also part of St. Louis and St. Louis County's network of homeless service agencies when the 10-year plan was adopted. The Salvation Army operates programs for the homeless in both the city and the county. 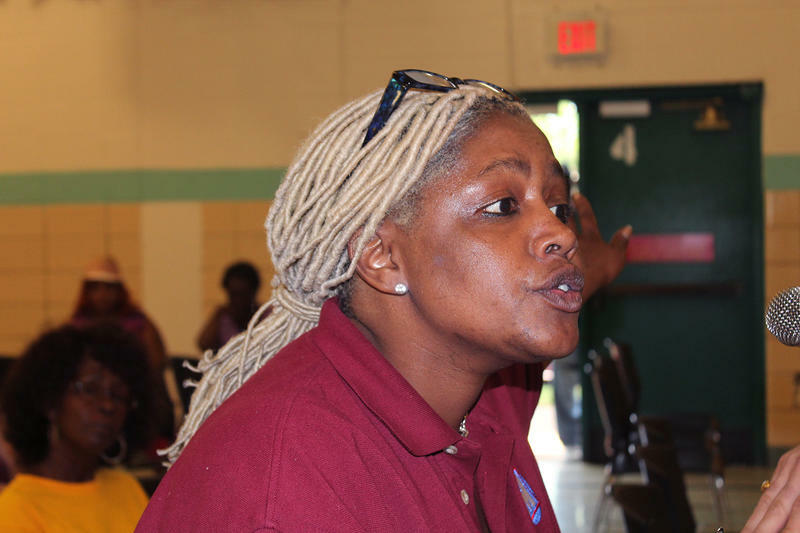 She said the plan successfully created a system to help people who become chronically homeless, but it was unrealistic to think that St. Louis could totally end it. “That was just not a good title from the beginning. And I’m probably one of the ones who said that back in 2004. I raised my hand. I was the thorn in the flesh when they said ‘Oh Kim we have to be optimistic.’ I was like ‘OK, well we can be optimistic but that’s just not realistic to me,’” Beck said. Beck also said social stigma plays a role. Private landlords don’t want problem tenants. And some people experiencing homelessness don’t qualify for housing because they don’t want to be diagnosed with a mental illness. “There’s a scripture that says the poor will always be among you. And I just realize there are some that are going to choose homelessness. Even if there is a house for them to stay in, if they don’t want it, you can’t force them to go in,” Beck said. These days homeless service agencies are focusing more on getting all people housed, not just the chronically homeless. They’re in the process of adopting a coordinated method of ranking people based on their level of need and working together to get them housed. There’s also a greater emphasis on providing rental assistance to people who just need a few months support to get back on their feet. Meanwhile, officials in both St. Louis and St. Louis County said they still have a goal to end chronic homelessness, but they’re hesitant to set a deadline. St. Louis was one of hundreds of cities to adopt a 10-year plan to end chronic homelessness at HUD’s urging in the mid-2000s. Utah is one of the few regions pointed to as a success story. 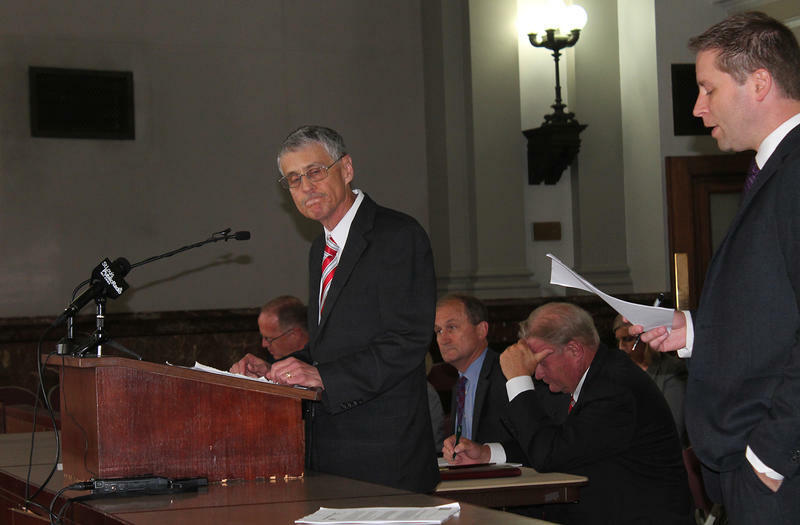 Updated on Wednesday, June 1, 2016, 2:00 p.m. to include the city's acceptance of a proposal - The city of St. Louis is one step closer to opening a homeless shelter on the near north side. Tuesday a city committee accepted St. Patrick Center’s proposal to run Biddle House with the help of Peter and Paul Community Services. Human Services Director Eddie Roth said the next step is to negotiate a contract with the agencies. 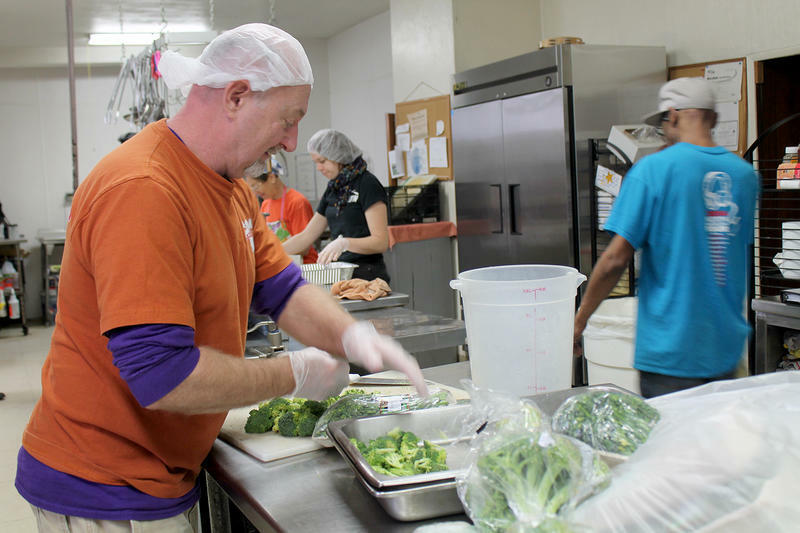 Wednesday was chicken, broccoli and rice day at the Bridge Outreach in downtown St. Louis. With the help of volunteers, Chef Charlotte McClendon serves close to 3,000 meals to the homeless each week. But the days where people without a place to live can go to the Bridge for a meal are now numbered. If their reception at a community meeting Wednesday night is any indication, the agencies who submitted the only application to run a new homeless shelter in St. Louis face an uphill battle to convince nearby residents they’ll be a good neighbor. The plan is for St. Patrick Center to oversee daytime operations at Biddle House, including intake, meals and placement in permanent housing for up to 125 men, women and children. Peter and Paul Community Services would be in charge of the 98-bed overnight shelter for men. 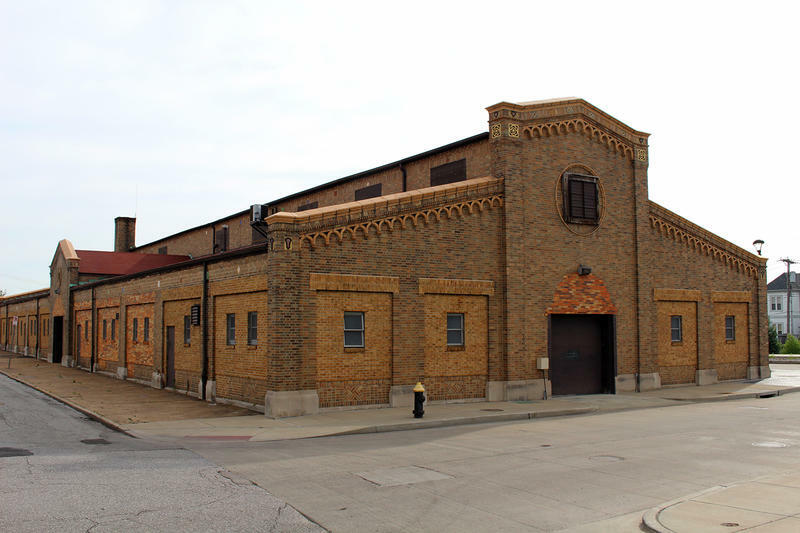 Updated May 26 with final testimony - By this time next month New Life Evangelistic Center could know whether St. Louis will give the downtown shelter a new occupancy permit without the approval of its neighbors. The city's Board of Building Appeals finished hearing testimony Thursday in an appeal requested by New Life. The shelter is also asking for an exemption to continue operating within 500 feet of a school. The appeal is a follow-up to a December 2014 ruling, when another city board found New Life was a detriment to the neighborhood.